Black sugar contains vitamins, minerals, and natural lemon extract. 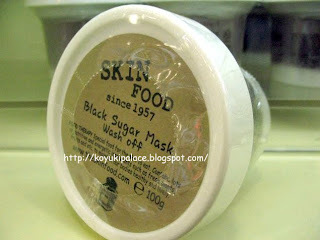 The Skinfood Black sugar mask can remove dead skin cells gently, stimulate new skin cells so it becomes easier to absorb nutrients in other skincare products. 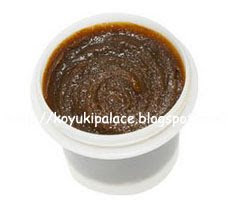 It makes your skin look radiant and it's suitable for normal to dry skin. The first time I was using it... got a bit confused... is this a scrub or mask?? As I was applying it onto my face, the sugar seems big... I treated it as a mask and applied a thick layer on my face. After 10 mins, I added some water and massage gently so it exfoliates my skin. I washed it off with warm to hot water so the sugar melts. After I am done, my skin feels so soft. But be careful not to scrub too hard, otherwise it might damage your skin. Not suitable for people with break out (acne skin). There's absolutely no sugar smell in this mask... but it smells like lemon.. but doesn't fit the name of the product at all... but it does contain lemon extract which helps whiten the skin, making it look radiant. Instructions: Apply onto damp skin after cleansing, apply a thick layer onto the face (avoid eyes and lip area), wait 10-15 mins, massage while washing it off with warm water. I would definitely buy this product again. It acts as a good exfoliator and I really love the softness it brings! !